Travel on the Tide ~: Take the Kids to Maine! It is always a difficult task to try and come up with interesting activities for the children when they accompany you on your trips around the country. Notice I say it may be difficult but it is not impossible. As an example, we decided to take a vacation to the state of Maine and as anyone would guess there simply is not an abundance of things for children to do. We still decided that there was sufficient interest on our part to visit this great part of America and as such we decided to still complete our travel plans. 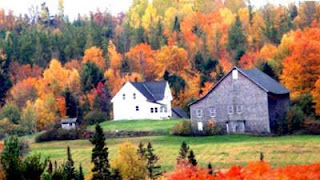 Most visitors to Maine never consider the possibility that Maine could also be considered a farm rich area. There are in fact a vast number of actual working farms located in this section of the nation. We decided that one way in which we could enjoy the state’s great outdoor environment as well as to provide the children with some interesting activities was to spend the day on one of the many animal farms in the state. The children were actually excited about this prospect as they would be able to see what happens on the farm while getting to know and understand other children. We were fortunate enough to locate a farm in Rockport that does exactly that. It was the Aldermere Farm. As you approach this vast farm you will begin to see acres of beautiful pasture land filled with the cows known as Belted Galloways. These are an interesting breed of cow in that they have a band of white which goes completely around their mid sections of their bodies. Besides seeing these unusual cows the farm offers the visitors a variety of seasonal tours as well as established activity programs. No farm visit of course could be complete without a side trip to nearby Jefferson’s Blueberry Hills Farm. You will find a vast array of farm animals here ranging from cows, and cattle, pigs, Shetland ponies, chickens and goats. Before you depart this farm you are offered the opportunity to purchase some of the finest organic produce in the area. In addition you can even watch them make their own syrup as they tap into their maple trees each year. In the fall you will see how busy the farms apple orchards become as the harvest begins. There is always something going on around the farm at all times of the year. Often you will find that many of the farms act as bed and breakfast inns allowing you to remain on the farm as long as you so desire. As you can readily see traveling to just about any area of the nation can be an exciting adventure for not only the adults but the children as well. Or you could take the kids to Mexico. 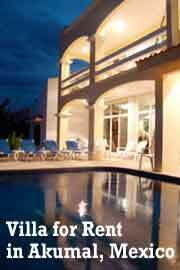 We have a House for Rent in Akumal, Mexico.